The most commonly used processes for imparting color to cotton are piece dyeing and yarn dyeing. In piece dyeing, which is used primarily for fabrics that are to be a solid color, a continuous length of dry cloth is passed full-width through a trough of hot dye solution. The cloth then goes between padded rollers that squeeze in the color evenly and removes the excess liquid. In one variation of this basic method, the fabric, in a rope-like coil, is processed on a reel that passes in and out of a dye beck or vat. Yarn dyeing, which occurs before the cloth is woven or knitted, is used to produce gingham checks, plaids, woven stripes and other special effects. Blue dyed warp yarns, for example, are combined with white filling yarns in denim construction. One of the most commonly used yarn dyeing methods is package dyeing. In this system, yarn is wound on perforated cylinders or packages and placed on vertical spindles in a round dyeing machine. Dye solution is forced alternately from the outside of the packages inward and from the inside out under pressure. Computers are used increasingly in dyeing processes to formulate and match colors with greater speed and accuracy. Printing colored designs on cotton cloth is similar to printing on paper. Long runs of the same fabric design are produced on a roller print machine operating at speeds between 50 to 100 yards a minute. As many as of 10 different colors can be printed in one continuous operation. A typical printing machine has a large padded drum or cylinder, which is surrounded by a series of copper rollers, each with its own dye trough and doctor blade that scrapes away excess dye. The number of rollers varies according to the fabric design, since each color in the design is etched on a separate roller. As the cloth moves between the rotating drum and rollers under great pressure, it picks up color from the engraved area of each roller in sequence. The printed cloth is dried immediately and conveyed to an oven that sets the dye. Automatic screen-printing is another principal method for imparting colored designs to cotton fabrics. Although slower than roller printing, it has the advantage of producing much larger and more intricate designs, elaborate shadings and various handcrafted effects. In flat bed screen-printing, the fabric design is reproduced on fine mesh screens, one for each color. On each screen, the areas in the design that are not to be penetrated by the dye are covered with lacquer or some other dye-resistant coating. The screens are coated with dye on the back and mounted in the proper sequence above a flat bed. As a belt carries the fabric along from screen to screen, a squeegee or roller presses the dye through the open area of the screen onto the fabric. The new flat bed machines can have speeds of up to 1, 200 yards per hour for a fabric with a 36-inch design repeat. Faster by far are the recently developed rotary screen printing machines with production speeds of up to 3, 500 yards an hour. The system combines roller and screen printing, utilizing perforated cylinders instead of flat screens. 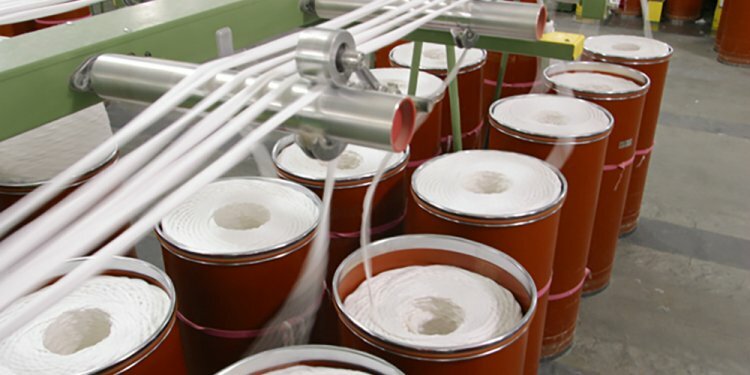 The color paste is fed inside the cylinders and a small metal roller forces the color through the pores of the cylinder onto the fabric which is moving continuously under the cylinders. As many as 16 colors can be printed on one fabric using this method. Use of this technique is increasing since the screens or cylinders can be produced less expensively than the engraved copper rollers used in roller printing. Finishing, as the term implies, is the final step in fabric production. Hundreds of finishes can be applied to textiles, and the methods of application are as varied as the finishes. Cotton fabrics are probably finished in more different ways than any other type of fabrics. Some finishes change the look and feel of the cotton fabric, while others add special characteristics such as durable press, water repellency, flame resistance, shrinkage control and others. Several different finishes may be applied to a single fabric.